The Sterling Dental Clinic is known to be a centre of excellence for dental implants, thanks to a combination of our fully trained staff and certified implantologists as well as the quality of excellent equipment we use. 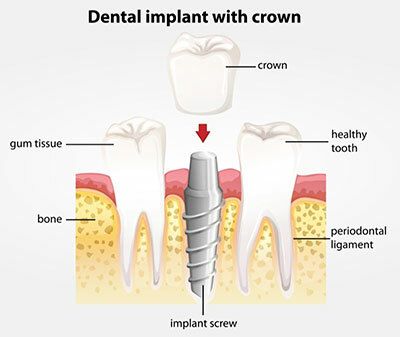 A dental implant is an artificial tooth replacement that generally serves two purposes. They are either cosmetic or prosthetics used to counteract a patient's tooth loss. Dental implants are gaining popularity because they are a more stable, comfortable and long lasting method for the replacement of missing teeth. The key part of the dental implant is the titanium implant. It sits exactly where the original tooth was located. Eventually, the titanium will bond with the bone and in some ways act as the original tooth would. This as well as the mechanical stimulation of the bone prevents the occurrence of further bone. Thus, a dental implant has become such a popular choice for both patients as well as dentists when it comes to tooth replacement. The implant itself is eventually capped with a crown, which will feel and look exactly like the rest of the teeth in your mouth. In many cases, this is the preferred treatment for missing teeth because it will not only act as the original tooth, but if cared for properly can easily last for the rest of a patient's life. 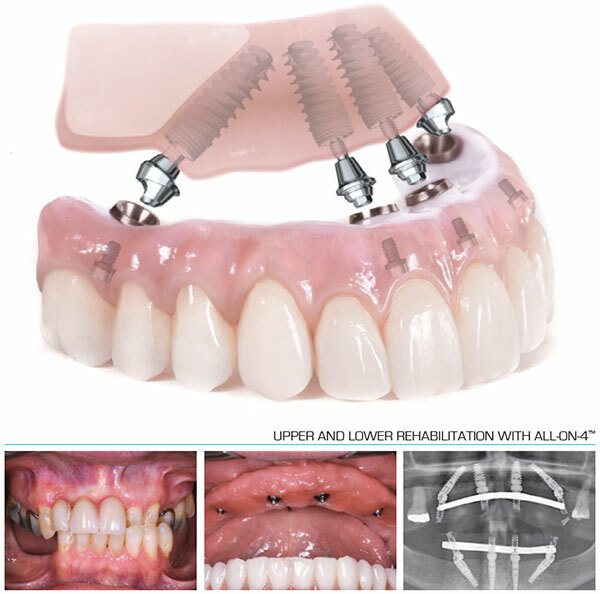 The Sterling Dental Clinic is proud to offer the innovative and technologically advanced All-on-4 (AO4) dental implant technique. If you wear dentures or have missing or failing teeth, the All-on-4 procedure is the optimal solution for you. It is proven and cost effective. And it will give you a lifetime of happy, healthy smiles. Traditional dental implant treatments require the placement of 6-8 or more implants per arch. The All-on-4 treatment involves the precise placement of titanium implants in the mouth that serve as anchors for a full dental bridge. In many cases, the bridge only needs to be supported by four dental implants. The All-on-4 dental implant procedure saves time and money, reduces healing time and anxiety. It alleviates the emotional stress brought upon by not liking how you look or feel. In most cases, with the All-on-4 procedure you can be eating and drinking things you never could before. And you’ll look good doing it! The All-on-4 dental implant procedure is recommended for people in need of full upper and/or lower restorations, no teeth, failing teeth, and those currently using dentures. The procedure utilizes as few as four implants (where traditional methods require 6-8 or more) and a full set of new implant-supported replacement teeth per arch, which you usually get in just one clinical appointment. Unlike other dental implant approaches, the All-on-4 dental implant procedure from The Sterling Dental Clinic can eliminate the need for bone grafting, sinus augmentation or other ancillary procedures. By eliminating bone grafts and offering fewer implants, the procedure is quicker, costs are lower, and the healing time is greatly reduced. All-on-4 is a minimally invasive procedure that will give you fully functional, real-looking replacement teeth the same day. If you have any queries about how All-on-4 can effectively solve your tooth loss problem, contact our professional team on +91-11-26152930 today! The latest addition to dental implant therapy is Ceramic Dental Implants, also known as Zirconia Dental Implants. 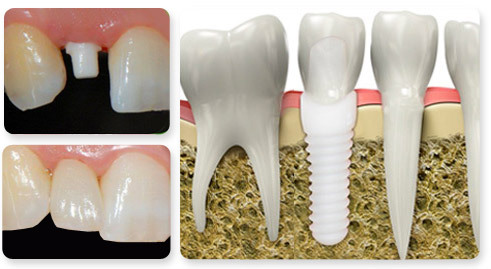 These dental implants are made from ceramic that has been successfully used in orthopedic medicine for many years. Zirconium oxide (ZO2) is also customarily used in aerospace engineering because of its high resistance to fracture and heat. White coloured zirconium substitutes the metallic grey appearance of titanium. Also, ceramic implants and crowns retain less plaque and calculus than titanium. Therefore the gum appears healthier with a more natural look. Along with these advantages, the Zirconium dental implant has all the biological qualities of choice for dental implants and restoration of your dentition. Zirconia has become popular as a desirable implant material because it interacts well with the natural gum and bone, making it biocompatible. Metal-free implants are biological dental implants, which means they’re a more holistic option for those interested in treatments that support total health. For cosmetic reasons, zirconia is a better choice as it’s a more natural colour. When it comes to dental hygiene, zirconium is favoured by many periodontists because it discourages the build-up of plaque and tartar in a way that titanium does not. That means less risk of gum disease in the future. Because of the increase in interest in holistic dentistry and metal-free treatments, ceramic dental implants are gaining in popularity. For patients who suffer from sensitivity to titanium, metal-free dental implants offer an alternative. Contact us for more information about ceramic dental implants. At Sterling Dental Clinic, we use Zygomatic implants routinely when there is not enough bone for ordinary implants. Zygomatic implants are used to provide support for implant bridgework where there has been a substantial amount of bone lost from the upper jaw, and where ordinary dental implants cannot be used on their own to support a bridge. Zygomatic implants are longer than ordinary dental implants, and engage the very strong bulk of bone that forms the cheekbone. This means that the implants can be used as an alternative to complex bone grafting operations, making it possible to carry out surgery in just one simple stage. An implant-supported denture is supported by and attached to implants. A regular denture rests on the gums, and is not supported by implants. Such type of denture is used when a person doesn't have any teeth, but has enough bone in the jaw to support implants. An implant-supported denture has special attachments that snap onto the implants. Implant-supported dentures usually are made for the lower jaw because regular dentures tend to be less stable there. A regular denture made to fit an upper jaw usually is quite stable on its own. However, you can receive an implant-supported denture in either the upper or lower jaw. Thanks to implants, you can thoroughly enjoy eating whatever food you want without any worries. You can forget about troublesome oral cavity hygiene and can take care of implants in the same way you treat natural teeth – by brushing them regularly. The application of an implant prevents bone atrophy. Implants allow for better disintegration and rumination of food, thus lowering the risk of stomach illness. If you have any queries or need more information about the various treatments we have on offer, please do Contact Us. Each type of implant has its own benefits. Therefore, during your first appointment with our expert team, we would personalize the best system for you based on your individual needs and case. With the right team, implant procedures are absolutely painless and extremely comfortable. Although, the team at Sterling Dental Clinic is excellent at surgical precision, they are given further training to carry out the procedures in a manner that is gentle and extremely relaxing for the patient. This is combined with a soothing ambience and most of our patients are very comfortable through the entire process. We even provide sedation options for patients upon request.